SophiaFramework UNIVERSE Application : Character-Recognition Application for BREW "Recog"
Home > Products > SophiaFramework UNIVERSE > Character-Recognition Application for BREW "Recog"
"Recog" is a character recognition application for BREW embedded devices with cameras. It is coded in C++ using SophiaFramework UNIVERSE. * To run the srouce code of Recog, download the free evaluation edition of SophiaFramework UNIVERSE. Character-Recognition Application for BREW "Recog"
Recog is an application that recognizes characters photographed by a BREW enabled phone's camera, using the complex PARCOR coefficient method. Recog is coded in C++, using SophiaFramework UNIVERSE. 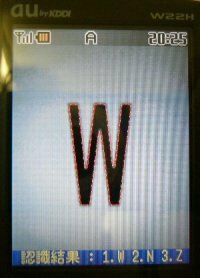 Given that camera functions are extremely machine dependent, Recog is insured to work only on W22H handsets ( Japanese BREW phone ). Instructions written in the following pages assume that readers already have experience with the BREW resource editor and handling camera functions with SophiaFramework UNIVERSE.